Hello, everyone, and welcome to a new Artist Limelight article! We are overjoyed to present to you another ArtLicenisngShow.com (ALSC) artist! 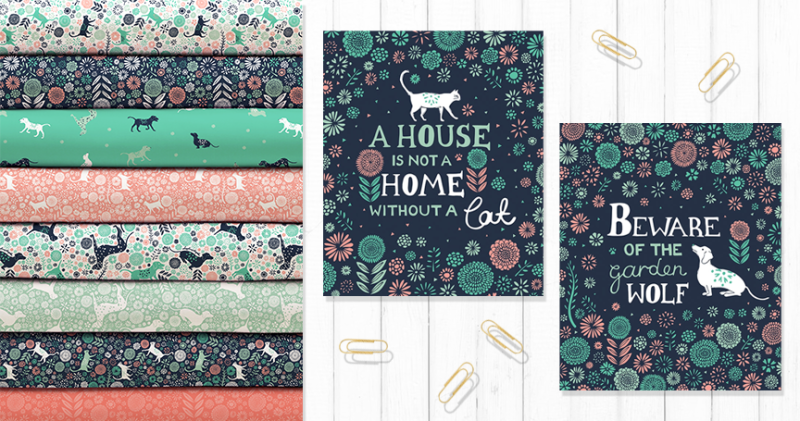 Today we spoke with Vicky Yorke, a surface pattern designer, and illustrator from the UK. Vicky started her career working with stationary, craft, and homeware manufacturers, which eventually lead her to a career in licensing. She was delighted to talk to us about her career in art licensing, and we’re thrilled to bring her words of wisdom to you! Hi, I’m Vicky, and I’m the owner and designer behind Vicky Yorke Designs. 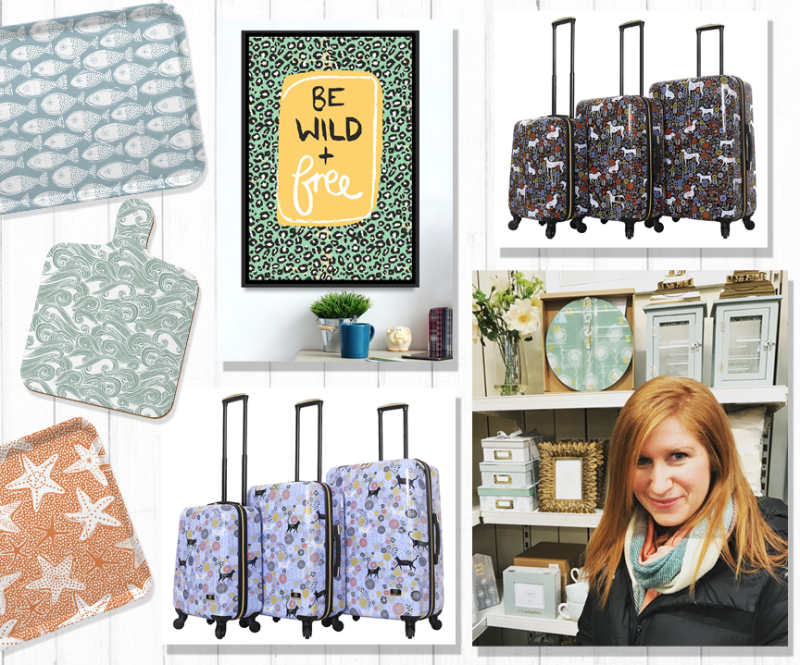 I’ve designed surface patterns and illustrations for products and worked on new product development for over 12 years. I’ve been freelancing since 2012 and decided to start licensing my work at the end of 2015. All of this is done from my home studio in semi-rural Worcestershire, UK, where I live with my husband and our beautiful black and white cat! Bright, uplifting and ‘grown-up’ whimsical! I love to create designs that bring fun and warmth to everyday living. I design a lot of patterns but also combine these with strong placement illustrations and my signature hand-drawn typography. I tend to design in collections – most of my designs can be used on their own, or for ultimate effect, they can be mixed and matched for a fun eclectic look! I’ve been really lucky. I had worked with stationery and kitchenware products for many years, but since beginning licensing I’ve been able to see my designs applied to so many different products including homeware and gift (clocks, candle holders, lanterns, vases, photo frames, light boxes, storage boxes, key boxes, trinket dishes, wall plaques), wall art, fabric by the yard, kitchenware (mugs, teapots, trays, chop boards, pot stands, spoon rests, worktop savers, placemats, coasters), stationery (notebooks, organizers, note cards), mobile phone cases, personalized gifts, and I’ve recently just launched a collection of luggage, which was super-exciting! I have new product launching in 2019 and can’t wait to see it! I’ve read the Print & Pattern blog for many years, which is a fantastic blog showcasing the best in surface pattern design. It was through that that I became interested in the idea of licensing as I loved some of the projects licensed designers were getting to work on. I started to work on my portfolio to create patterns and illustrations that suited the direction I wanted to go. A little bit more research lead me to Art Licensing Show and joining up turned out to be one of the best decisions I have made. The community of artists and designers are so generous in sharing their experiences and I learnt such a lot about the industry through being part of the site, as well as having the ability to connect with manufacturers. 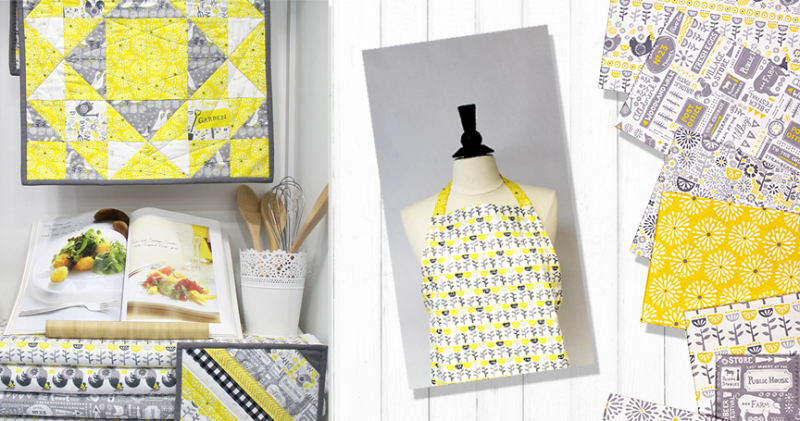 Again, I started with my go-to Print & Pattern Blog. I looked at my favourite designers and who represented them. Most importantly I really considered what I wanted to get out of having an agent. (I didn’t just want one for the sake of it!) I knew that my style was much more suited to product than children’s books, for example, so I narrowed it down to the agents who were working with the type of manufacturers who made the products I wanted to see my work on. Jewel Branding & Licensing were my number one choice – I approached them through their submission process and after various Skype calls and a little more development of my portfolio I was so delighted when they agreed to represent me. I love having an agent! Being in the UK, it is very difficult for me to know about all the different manufacturing companies who are licensing in the USA. Without my agents, my work simply would not have been seen by so many prestigious companies. Jewel’s reputation for developing successful brands has brought new licensing partnerships for me who I could never have reached alone. They put so much work into helping me display my work to potential partners, whether it is through their state of the art website, or through the shows they exhibit at, I could not be happier! Then there is the legal side of things… Licensing contracts are laborious and everyone seems to be different, so it is incredibly reassuring to have such experienced agents on hand at all times to offer advice and guidance. Because they work on a large amount of the business side of licensing for me, it frees me up to create more artwork. They are such a wonderful team too – it really is a delight to work with them! Q: What motivates you to create? There are so many things, but nature and travel are always big triggers for my creative process. Whenever I’m walking through the farm near my home in Worcestershire and I see the ducks and the pigs, or when I’m by the sea, I just want to draw and sketch. I don’t usually have a problem coming up with ideas – the problem is more having time to get them all down on paper. I also have a lot of experience with trends and like to use popular trends as a catalyst for new ideas, by using the motifs of the moment, but reinterpreting them in my own unique style. Q: Can you please tell us about your art-making process? Every design begins with a pencil sketch, which I then ink over with a fine-liner before scanning into Adobe Illustrator. I use the live-trace feature to convert my drawings into vectors before digitally colouring. Some designers ‘clean up’ their work at this stage, but I like to leave in wonky lines and broken textures because it keeps the originality of the drawing and adds warmth and authenticity. Having my files in vector format helps me when preparing my designs to be used across multiple product categories as they can be easily scaled and edited without losing sharpness. It’s also quick to alter colours for manufacturers and because I always work with Pantones it is easy for the manufacturer to create a whole collection of different products all with matching colour references. I have a degree in Illustration BA(Hons), but my style from university was completely different to the designs I am producing now. Back then I was still trying to find my style and created a lot of digital collage in Photoshop. I really found my style while working in my first role creating back to school stationery. I realized that my natural handwriting was a good fit for product and have been refining it ever since. Q: What would you consider to be key to your success as an artist? I have spent a long time researching and understanding what makes a good design for product and I feel lucky that my design style is really quite versatile across lots of different categories. Having a lengthy background of working with manufacturers, I do understand all aspects of the product development process and that has proven to be very useful for me. Although I’ve been lucky to license across so many products so far, I feel that I am still in the early stages of my licensing career – there are so many possibilities and opportunities arising all the time and I can’t wait for what the future holds! This year I entered The Really Good Design Search For Greetings & Gift in the UK. I had fairly low expectations as I hadn’t licensed onto greeting cards before and wasn’t sure where my style fitted within that market. I was amazed to not only make the shortlist but to be named the overall winner of the competition. All entries were judged by an industry panel comprising Alan Harnik of US company Notes & Queries, WH Smiths buyer Claire Castle, Jenny Cummins of Sydney-based McMillan Cards, Postmark’s founder Mark Janson-Smith and Progressive Greetings magazine editor Jakki Brown. I was blown away to be selected by such a prestigious panel and am now looking forward to launching two new collections of greeting cards with Really Good / Soul UK at Spring Fair, UK 2019. Q: Who inspires you as an artist? My design hero is William Morris. I am obsessed by his art nouveau patterns and am fascinated by how they look as fresh on product today as when they were designed around 150 years ago. One of my favourite things is to walk around a National Trust property in the UK, where Morris wallpapers and art hang on the wall, to look at his tapestries and beautifully upholstered chairs and intricately patterned curtains and cushions, which look fabulous in the period houses, but similarly work so well as reproductions in modern home décor! To me, he has inadvertently become the ultimate licensed artist! I would want to know that licensing is an extremely long process. I’ve heard it described multiple times as a marathon and not a sprint! (I was warned of this, but still not properly prepared for it). I have had false starts along the way and that can be quite disheartening when you’re starting out. And even when a contract works well there, it can still be a long product development period before a product is released. But if you persevere, it is so worth it when you see your designs on product in store! It’s the best feeling! I really do love the community and that so many different artists and designers are prepared to share their valuable experiences. I also really enjoy the judged challenges – it’s yet another great way to get artwork in front of new art directors and manufacturers! That’s a hard one, as there are so many! I just want to continue to establish and maintain good licensing partnerships, as well as grow my art licensing business into new categories. I love licensing onto fabric and my designs really come alive in that medium, so I’d love to do bedding, kitchen textiles and pillows soon, but I’m open to everything! Fingers crossed! First, put together a strong portfolio of designs that shows off your style and keep adding to it all the time. As well as all the standard themes, every year I try to work on at least one collection that tackles a subject matter that really challenges me, which helps to keep my portfolio fresh and diverse. Don’t try and make your work look like someone else. (I’ve come to realise it’s the quirks in my designs that make them licensable!) Then make lots and lots of contacts! (ALSC is perfect for this!) You never know who is looking for what art and when, so it’s great to get to know as many different companies as possible. Grow a thick skin because you will experience multiple rejections for every yes you receive and you can’t let it get you down. If a company says no to your artwork, it doesn’t necessarily mean it’s bad, it’s just not a good fit for them at that time. If they ask you to keep in touch take that as a big win and contact them periodically when you have new work to show as you never know what might happen in the future! Good luck! 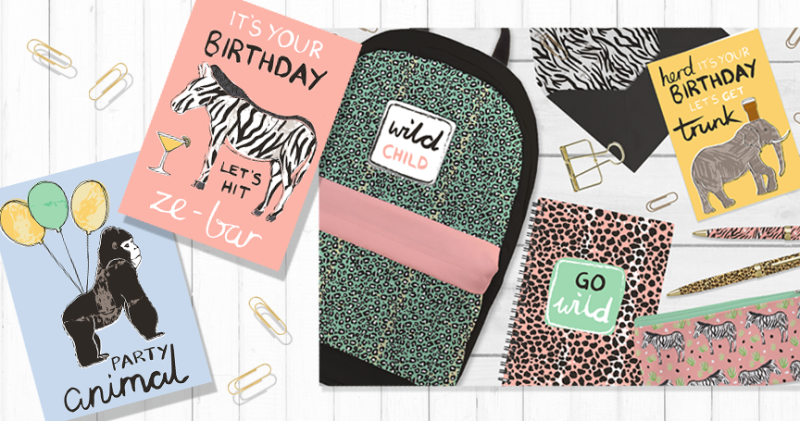 In 2012 Vicky decided to become freelance and later expanded her business into licensing, building a design brand with her bright and whimsical designs. 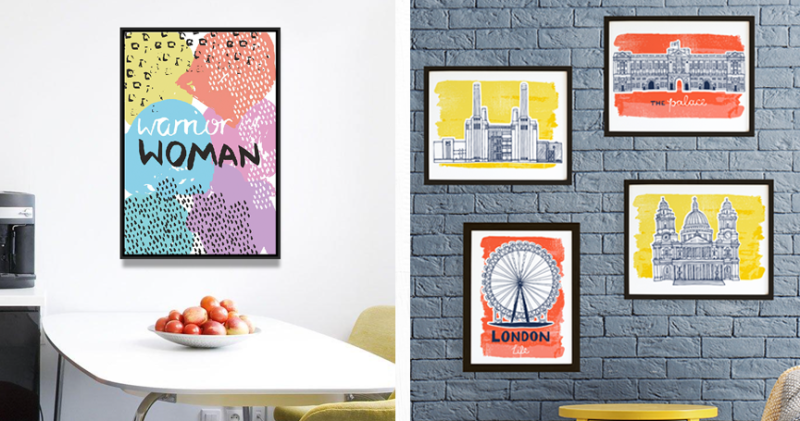 Vicky uses illustration and typography combined with striking colour palettes to create work that is decorative, bright and inviting. She is often inspired by the beautiful countryside that surrounds her home with collections including vibrant florals and woodland animals, as well as patterns influenced by her travels around the UK and beyond! Every design is hand sketched in her loose and fanciful style before being digitally coloured to create designs that are full of ‘grown-up whimsy’. Connect and request access to Vicky’s complete portfolio on the ArtLicensingShow.com® (ALSC) and visit her website at http//www.vickyyorkedesigns.co.uk. This entry was posted in Limelight Licensors on December 18, 2018 by Art Licensing Show . ← ALSC 3rd Annual Holly Jolly Christmas ART Show! Really nice story Vicky…your work is lovely! I too adore William Morris! 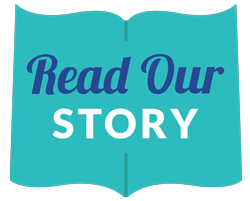 Thanks so much to ALSC, for sharing your story, Vicky Yorke!!! Great article, with fun patterns!!! Continued Best Wishes!!! That was a wonderful read. Congrats on your licensing success!! It sounds like you have an awesome 2019 around the corner. Best wishes. Inspiring interview, Vicky. Good on you! Bravo! You are such a star!!! Very inspiring interview Vicky! I am starting out in art licensing and will be doing my first blueprint tradeshow this May 2019. Your work is so beautiful and I enjoyed reading about your experience with art licensing. Great Interview Vicky – Always inspiring to read about other art licensing artists. Have a Great Christmas!